Explore Nambung National Park and Yanchep National Park on a full-day tour from Perth. Travel into a landscape of strange rock formations in the Pinnacles Desert, try sandboarding at the Lancelin Sand Dunes, and keep your eyes peeled for Australian wildlife like kangaroos, koalas, and colorful birds. You'll also learn about the local Noongar aboriginal culture in the Wangi Mia (talking place) and have a chance to swim in the Indian Ocean. Includes morning tea, picnic lunch, transportation, guide, and hotel pickup and drop-off. Tour starts from 300 Wellington Street, Perth, at 7.00am. Please phone +61 412 930 777 if there are any problems with pick-up time/place. Great nature and plenty of time to explore them. Ron was great too. He did everything: drive, prepare the food and inform us about the places we saw. Very easy to get on with and made the trip easy and fun. I would 10/10 recommend this trip. So much to see on this tour. Only nine people on the tour but a really nice group. Driver/tour guide was very informative. Snack, breakfast, lunch and afternoon snack were all included in price. Tasted smoked emu for the first time and was pleasantly surprised that we enjoyed it. Yanchep National Park was beautiful. Saw loads of koalas and kangaroo here. Sand dunes and Pinnacles were amazing. It rained a bit and was quite windy but it helped to keep the flies down. This was a fabulous small group tour. Our guide was knowledgeable and super friendly. He made sure we were well taken care of and had little touches at each stop to make the experience special. This is a fairly new tour operator - Travel Western Australia and the price was better than the other ones but superior in service. We went to Yanchep Park first thing in the morning which allowed us to see lots of kangaroos and koalas about and then he made us a wonderful morning tea picnic where we had kangaroo, emu fruit local jams cheese crackers. Next we went to the sand dunes whee we all went sandboarding followed by more fruit. Then a picnic lunch by a beach and then the pinnacles where we could go off on our own or follow him for a tour. He took photos and videos everywhere we went and shared them all with the group before heading back. The best part was although he had an outline of where we were going he never worried about a struct timeline always stating at each location we would stay as long as everyone wanted. Would highly recommend this tour over the other ones offered. Fabulous day! Guide was very knowledgeable and provided a variety of delightful snacks ranging from bush preserves at morning tea to chicken wraps and ice cream and fresh fruit to keep us all going as the day progressed. 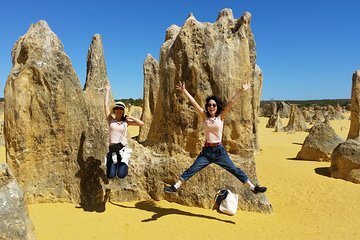 Yancheng provided an opportunity to observe kangaroos, koalas and a variety of colourful wild birds in their natural environment, sand boarding was great fun and our time at the pinnacles allowed us plenty of time to walk amongst and observe these spectacular features close up. Awesome experience and Sam the guide was extraordinary ! Great guide (Sam), warm, very knowledgeable and he truly made this trip a fantastic one. Good value for money. Small group. Excellent day trip, thoroughly recommend. First stop - Yanchep National Park, koalas, kangaroos, bird life, lake, lovely park, morning tea. Then sand dunes at Lancelin - very windy, take care of cameras and eyes. Good fun, beautiful views. Hangover Bay, still windy, beautiful bay. Pinnacles amazing, still a little windy here, but not as bad as the exposed sandy areas.